1. Entryways set the tone – make sure the sidewalks and porches are swept clean and pathways are clear. Completely empty coat-racks and coat-hooks. 2. De-clutter, de-clutter, de-clutter – keep it simple and clean! It’s okay to have empty spaces. End tables should have no more than one to two items on the surface—and that includes a lamp. Clear rooms for easy walkways and a greater sense of roominess. Remove those extra sofa pillows, plant-stands, baskets and toys. 3. Ensure your kitchen is healthy – it’s the heart of the home. Countertops should have no more than three small appliances. Clear the countertops of everything else. If you have glass cabinet doors, make sure the contents inside are attractive and not cluttered. Replace your hardware for a quick, inexpensive update. Put out a large bowl with fresh fruit or a vase of fresh-cut flowers. 4. Keep the personalization to a minimum – we love our family pictures, but the living room and dining room is not the place to display them. Limit yourself to one or two small pictures displayed on a bookshelf. And that beer mug collection? Put it behind cabinet doors! 5. Position your furniture - create comfortable conversation centers by having furniture facing towards each other. 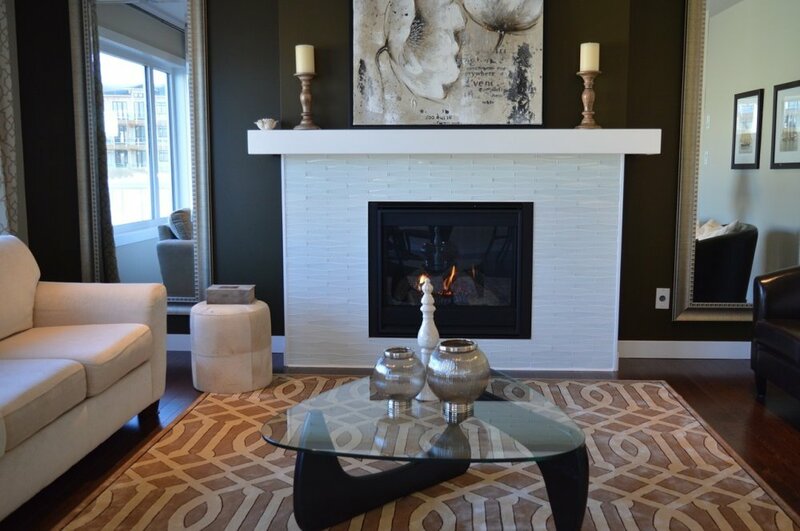 Or, group your furniture to face a focal point like a beautiful fireplace. 6. Dress up the dining area – place a runner across the middle of a polished wood table and place a couple candles or flowers in the center. Keep it minimal to avoid clutter. Remove unnecessary objects and articles on the floor like baskets and wine racks. 7. Use area rugs – these help to define spaces with open floor plans and they help reduce noise. 8. Light it up – the more light, the better! Natural light is best, but when visitors will be there in the evening, make sure all the rooms are well-lit. Use recessed canned lights over the fireplace. Have a light at both ends of each room and turn them up. 9. Freshen up your scents – but keep them light, clean and neutral. Studies have shown complex odors can distract visitors, but the absence of odor is less desirable than a simple one. Choose one scent and use it throughout your home in candles, oil lights, plug-ins, or in a pan on the stove: orange, lemon, pine, basil, cedar, vanilla or cinnamon. 10. Prepare bathrooms – keep the countertops bare, layer clean towels, put on a fresh, full roll of toilet paper. Remove toddler stools and seats. Ensure the entire room is sparkling clean! Thanks to Alison Stankiewicz Miller at John V Schultz Co. for her contributions to this article.